IS IT POSSIBLE TO… • Model customer goals, activities, and tasks as a team in less than 1 hour, without lengthy requirements? • Test and iterate your design 20 times before lunch, while relaxing in your favorite coffee shop? • Finish innovative mobile design in less than 3 weeks, with complete confidence that it works? Indeed, and much more. All At the cost of… About $1. The $1 Prototype is the result of five years of obsessive quest to perfect a lightweight mobile design methodology. It contains the collective wisdom of more than 50 events, workshops, and university courses in 10 countries and intensive design work with Fortune 500 clients and startups, which resulted in multiple featured apps in both Apple App Store and Android Play Store. 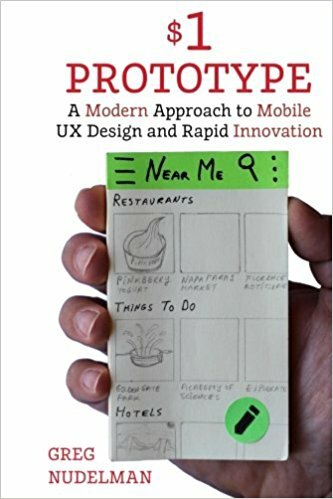 From Silicon Valley to Tel-Aviv and Dubai, Greg Nudelman, author of 4 mobile UX design books, fixated on one question: For all things mobile, what’s the most effective way to produce a design that works? Hundreds of case studies later, this book contains the answers. From Android Material Design and iOS8 to Responsive Web Design (RWD) — it’s all here, and it all works. YOU WILL LEARN (IN LESS THAN 20 MINUTES EACH): • How to save *months* by designing and prototyping at the same time • How to rapidly model goals, activities, and tasks with storyboards • How to design Android Material Design and iOS8 apps • How to design Responsive Websites for mobile and tablet • How to guerrilla test 20 or more people in the single morning • How to design and test Google Material Design Transitions • When and where to do usability testing and how to ask non-leading questions • How to effortlessly integrate UX research and design into Agile Scrum • How to take advantage of Zen Buddhist awareness techniques in product visioning, design and usability testing And that’s just the tip of the iceberg. The book covers 31 questions, with 4 real-world case studies and hours of live-action video. You don’t need expensive design software, time-consuming deliverables and extensive documentation. You need simple, compelling UX techniques that produce immediate results. That’s exactly what The $1 Prototype delivers.